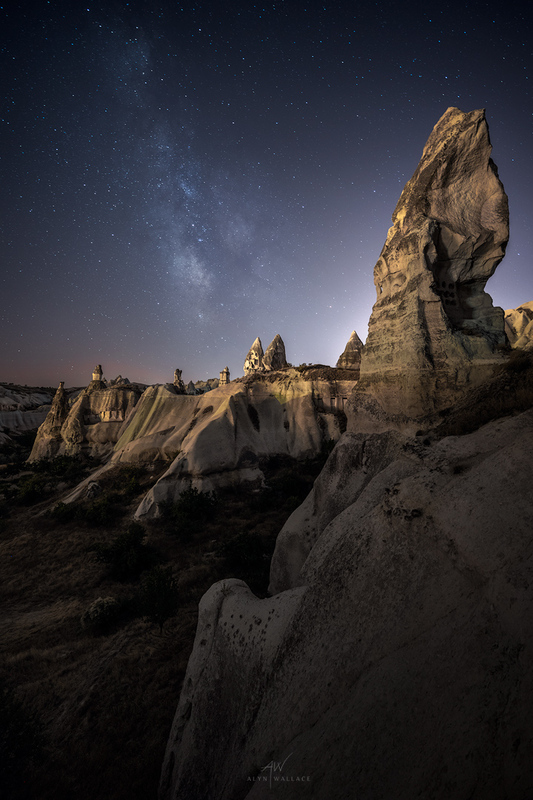 Join us for an incredible week-long workshop in the other-worldly location of Cappadocia, Turkey. A lunar landscape scattered with fairy-chimneys, cave dwellings, and honeycombed hills, it’s sure to blow your mind. 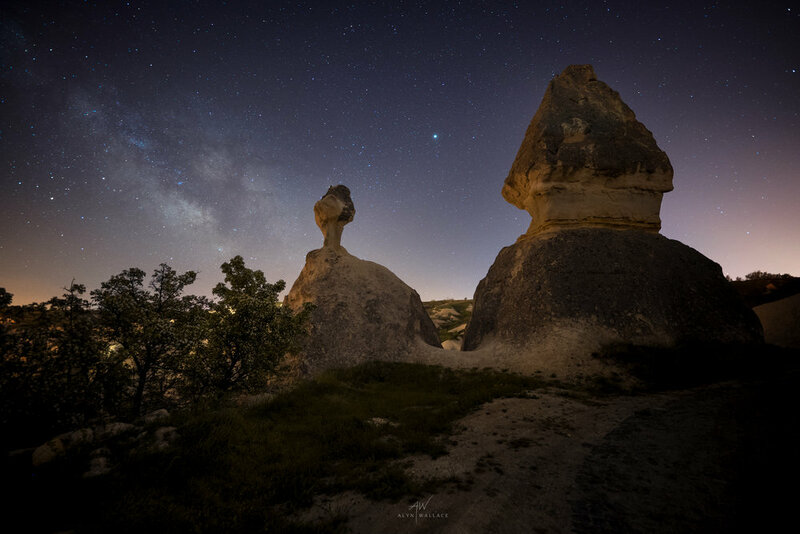 We will be there during the new moon phase and with favourable weather conditions we will have the opportunity to photograph the stars and Milky Way above the alien-like rock formations. During the sunrise hours the skies are scattered with hot-air balloons of all colours and we will also be flying in a private group session one morning, perfect to catch that golden light from a unique perspective. Daytimes are spent with pleasant hikes through valleys where you’ll struggle to see another soul other than local farmers who will likely offer you a free taste of their organic crops. Alyn has spent a lot of time hunting the ‘off the beaten path’ areas and making friendly ties with the locals. There’s also plenty to see and do in the area. Historical sights such as underground cities and painted cave churches as well as something a little more exhilarating in quad-biking and horse-riding. We will be accompanied by Turkish guide Uğraş, an old friend of Alyn's and a wealth of local, historical, and cultural knowledge (last year’s delegates dubbed him ‘the Oracle’). You'll be in the right hands for a fully-immersive and informative experience of the local culture and cuisine. Alyn is also at hand for any Turkish-English translation needs although there is well spoken English in the area. Photographically, we will be taking advantage of golden hour, twilight and night-time. There will be opportunity to photograph the stars and Milky Way, though delegates must be aware that this area is not considered as an exceptionally dark area. 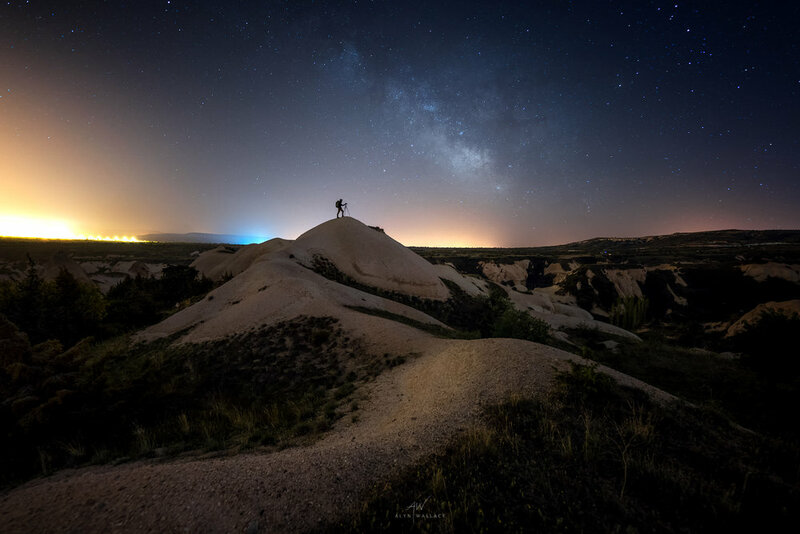 What it does offer however is favourable weather conditions to capture the night sky in a completely out-of-this-world landscape. During one sunrise we will be flying in a hot-air balloon for some golden hour aerial photography so please make sure to bring a neck-strap for your cameras! Whereas some balloons cram upwards of 20 people on one balloon, we will have our own private balloon, giving you freedom to move and compose your shots whilst being able to breathe! We will enjoy an open-air breakfast prior to the hour-long flight, before landing for a champagne toast. We will also be embarking on a number of short hikes (1-3 hour return) where the land is mainly flat. For this reason good walking boots are needed to handle the rocky and sandy terrain. During the workshop there will be numerous opportunities to visit open-air museums and sights of interest. These are optional and any entry fees are not included in the price. Delegates may wish to go horse-riding or even quad biking in the free time available during the daytime, these again are optional and at your own expense. 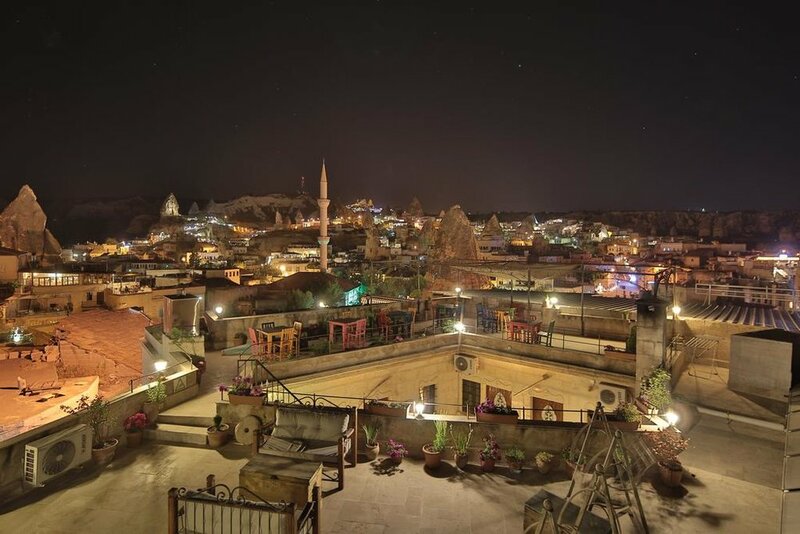 We will be staying in the heart of Cappadocia, Goreme. Our hotel has a fantastic roof terrace view where we can enjoy the hot air balloons over breakfast. Each delegate will have their own private double room with en-suite. The hotel is also equipped with WiFi and basic facilities. 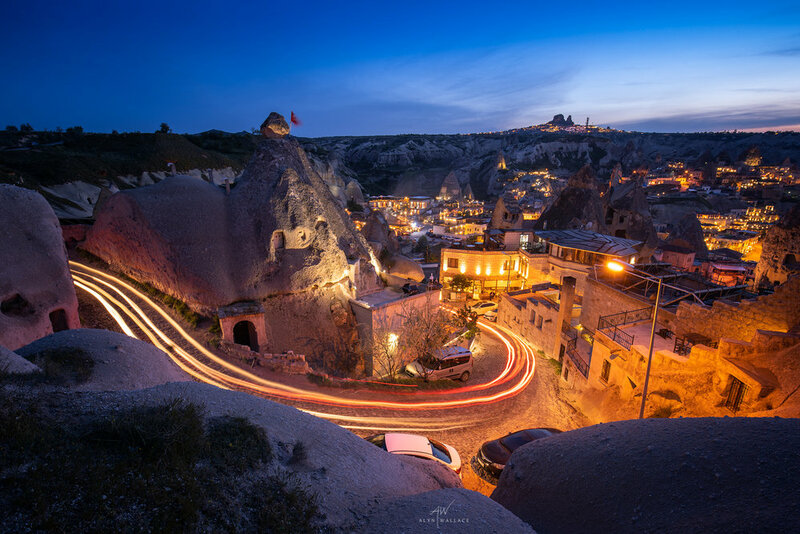 There are no direct flights to Cappadocia from the UK so a stopover must be made in Istanbul before jumping onto a domestic flight and so it may be an opportunity for a night or two exploring the city. The flight to Istanbul takes about 4-hours and the domestic flight about 1 hour 20. There are two main airports in Istanbul (Sabiha Gokcen and Ataturk), either are fine. 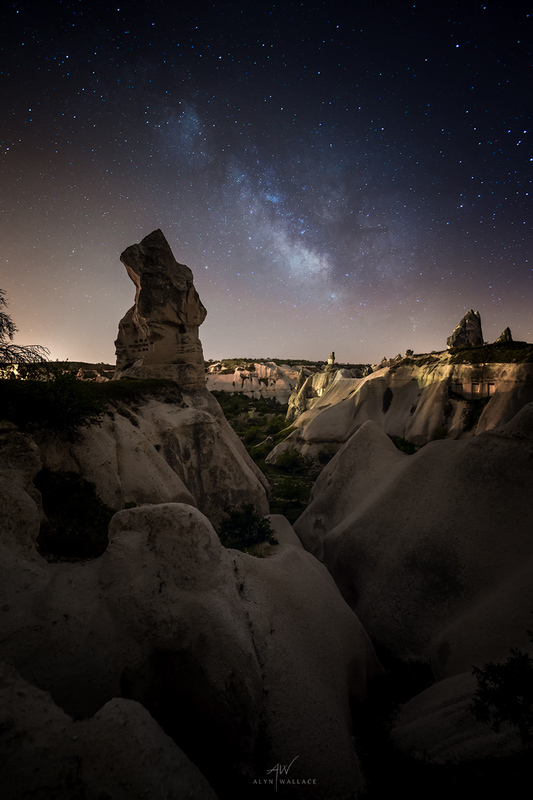 There are also 2 airports close to Cappadocia (Kayseri and Nevsehir), both are OK and Alyn will send out his recommended flights to delegates who book on. Where possible, Alyn will collect you from the airport, however, in the case of a clash with other members you may need to get an airport transfer to Goreme, in which case Alyn will re-imburse the cost. You will need a visa, however, these can very easily be obtained online before the trip and Alyn will send out all instructions to delegates upon booking the workshop. - Hiking boots. There will be 1-3 hour hikes on rough, rocky and sandy terrain.